James Harrison Wilson’s career in the five years after he graduated from West Point in 1860 was spectacular. He started the Civil war as a topographic engineer and worked on General George B. McClellan’s staff before and after the Antietam campaign before transferring in November 1862 to the staff of Ulysses S. Grant, where he worked as an engineer and inspector general He later joined Assistant Secretary of War Charles A. Dana in Washington to organize the cavalry corps. 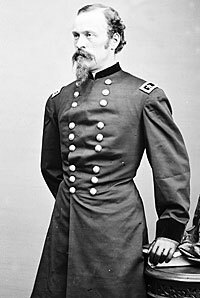 He headed cavalry corps during the spring 1864 campaign toward Richmond, the December 1864 defense of Nashville, and the 1865 campaign into Alabama. He also was in charge of the capture of Confederate President Jefferson Davis. In the process, he also became friendly with Abraham Lincoln – with whom he occasionally socialized. Wilson was closely linked to both Grant and Dana, with whom he wrote a campaign biography of the Union general for the 1868 presidential race. However, in 1869, he told Dana that he was to be appointed Collector of the Port of New York – a post which Dana strongly desired. Dana did not get the post and subsequently turned viciously on Grant. 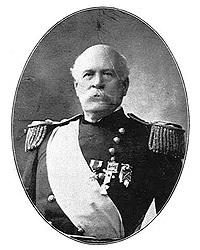 The Illinois native may have been the only Civil War general who also served a major role in Spanish-American War and Boxer Rebellion over thirty years later. Wilson had retired from the Army after the Civil War and worked as both an engineer railroad official and an author. His books included Under the Old Flag, the Life of Charles A. Dana, and The Life and Service of William Farrar Smith. David Coffey, Sheridan’s Lieutenants, p. 5. Edward G. Longacre, Lincoln’s Cavalrymen>, p. 252. Victor Hicken, Illinois in the Civil War, p. 177-178. Bruce Catton, This Hallowed Ground, p. 363. Edward G. Longacre, Grant’s Cavalrymen: The Life and Wars of General H. Wilson, p. 103. Rufus Rockwell Wilson, editor, Intimate Memories of Lincoln, p. 484. Edward G. Longacre, Grant’s Cavalrymen: The Life and Wars of General H. Wilson, p. 104-105. James Harrison Wilson, Under the Old Flag, Volume I, pp. 348-349. James Harrison Wilson, Under the Old Flag, Volume I, pp. 349-350. James Harrison Wilson, Under the Old Flag, Volume I, p. 351. William C. Harris, With Charity for All: Lincoln and the Restoration of the Union, p. 138. Edward G. Longacre, Grant’s Cavalrymen: The Life and Wars of General H. Wilson, p. 214. Carl Sandburg, Abraham Lincoln: The War Years, Volume II, p. 539.